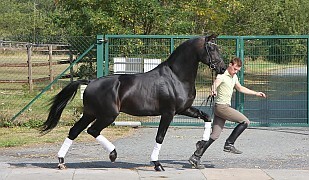 Gorgeous black mare with exceptional international dressage pedigree and wonderful bloodlines for dressage and breeding. This mare has three first rate gaits with a ton of elasticity and rhythm. In particular, her active hind leg comes with a lot of capacity, promising a bright future in the dressage arena. She is easy to ride and comfortable, while offering great focus and willingness to the discerning rider. Although she has not been ridden since she was inseminated, here is an video from an earlier stage in her training under saddle. She has already shown this level of beauty and power as a foal, winning the qualification for the German Foal Championships. Her sire, Ron Rubin (Rubin Royal/Donnerhall/Pik Bube), is out of a world-famous German dam line (Dam of the Finnländerin). 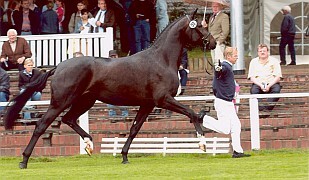 His dam is the full sister of the legendary sire Don Schufro/Andreas Helgstrand (Number 1 of the German breeding list). 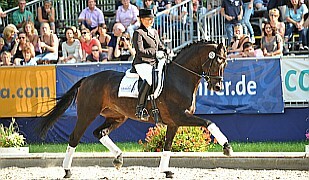 Furthermore, Diamond Hit/Emma Hindle (also in the top 1 % of the German breeding list and nominated for the Olympics) and Rohdiamant/Lisa Wilcox (one of the best dressage horse producers in Germany) add even more star power to this already impressive Pedigree. On her dam side, the breeding has also been carefully calibrated for quality and success. 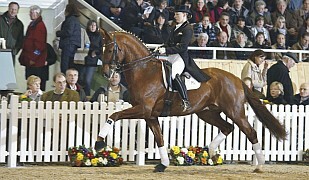 Her blood lines (Hanoverian line 620, the Cadarina line) are widely known for excellent licensed stallions (e.g. 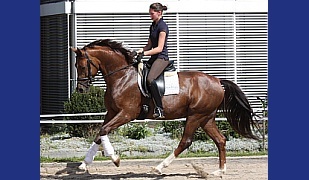 Donatelli I, II, Placido), top sport horses like the Olympic horse Prestige (Franke Sloothaak) and countless highly successful dressage horses. 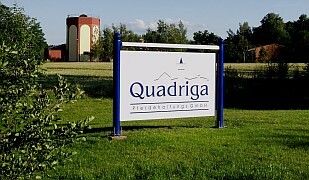 Her grand dam, Riefca, produced the licensed stallion "Dorado" (out of Davingnon I), while Riefca’s sister, Randale (out of Rubinstein), produced the licensed stallion "Edingburgh van D" (out of Don Renoir).